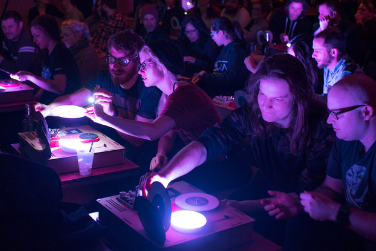 DJ Kid Koala shares an innovative collection of dreamy, atmospheric tracks and invites every audience member to contribute to his fluid stream of sounds through mini turntable stations with color-coded custom vinyl and effects processors provided at each table. The Artist Partner Program brings you the new Speed of Sound Sessions (S.O.S. ), a celebration of musicians who support and promote composers whose work was created in the 21st century and who respond to the contemporary world in which we live. The S.O.S. Sessions are a fun, interactive way to engage with adventurers just like you. Stay after and join Kid Koala for a post-performance Q&A!